Where do you usually study in the campus? Do you prefer to study in a deadly silent place or a bit loud place? 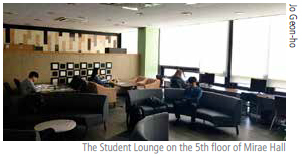 Besides the Main Library, the University of Seoul (UOS) has variety of study lounges ready for its students. Each of the study lounges has a distinct characteristic so that it can provide any environment that students require. In this article, The UOS Times will tell you about each of the distinctive study lounges throughout the campus. If you want to have an enthusiastic and lengthy discussion with your friends, Jihalounge (Basement lounge, in English) at the basement of Mirae Hall is the perfect place. Every desk in Jihalounge is a long desk where you can sit down and discuss with several friends. Also, Jihalounge has the longest operating time of all lounges in UOS (from 7 a.m. to 11 p.m., open 24 hours during the exam period). As users come to the lounge in groups, the atmosphere in Jihalounge is lively and somewhat noisy. So, if you want to study alone and silently in Jihalounge, it is better to go at late night. One of advantages of Jihalounge is that a cafe and a convenience store are located at right next to it. Unfortunately, there are some broken chairs and the sanitary condition of the desk and chair is not good. The Student Lounge on the 5th floor of Mirae Hall has a much quieter atmosphere than the Jihalounge. So it is an ideal place for having just simple questions and conversations while studying with friends. The 5th floor lounge features a large circular sofa in the middle and computer seats facing the window. On large round sofas, students often have simple meetings or discussions. There are also bookshelves furnished with business magazines and a standing desk next to the sofa. The computer seats are facing directly toward the windows and can be bright even through the curtains on days when the sun is strong. But at night, it is a very attractive place to study because you can study in the wonderful night view of UOS. There is an outside lecturer’s rest room in the lounge with a partition in between. Most of UOS students are surprised to find that there is a student lounge in Liberal Arts Building. Perhaps, many students do not know it since the study lounge is the smallest lounge in UOS and located on the top of the building. It is a small-sized lounge that can accommodate up to about 20 students, but it is unusual for the lounge to be full. It seems to be suitable place when you want to study alone and quietly rather than group study. 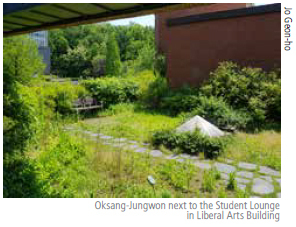 The greatest feature of the lounge is the adjoining Oksang-Jungwon (roof garden, in English). When you walk around Oksang-Jungwon, it will completely relieve your fatigue from hard studying. Students who are bored with the stuffy air and confined spaces in the main library should go by all means. Unlike other lounges, the Lounge on the third floor of the Law School has a unique name, “ALTI Lounge”. ALTI Lounge has its name because of the donation of Kim Moon-young of ALTI Group, our school alumnus. “ALTI” means high in Latin. Besides its unique name, it has a famous bakery chain store inside, Paris Baguette. For that reason, ALTI Lounge is always full of delicious smells of bread. If you are planning to study while eating light refreshments, this place is the best place to be. The Student Lounge on the ground floor of the 21st Century Building is the newest lounge that was remodeled last year. This Lounge has the highest quality of facilities and cleanliness among the school lounges in UOS, especially because it has eight seminar rooms. However, two are used as counseling room by the Employment Start-up Center, so only the remaining six are available for UOS students. The air of the lounge is quiet and pleasant so, whether you study alone or in groups, any case is suitable for this Lounge. The Global Lounge and K-lounge are located at the 4th floor of Changgong Building. Since those Lounges are places where foreign exchange students come together to study Korean or have meetings, many foreign exchange students go to the Global Lounge and K-lounge. One noteworthy thing about using Global Lounge is that students who do not take language classes cannot use this lounge from 9 a.m. to 12 p.m. until the classes end. The atmosphere of Global Lounge and K-lounge are very active and comfortable. In the Global Lounge, various ornaments from abroad and many foreign language books are displayed on shelves. The K-lounge also has ornaments related to Korean traditional culture. If any students want to study foreign language and speaking, this place is ready for them to come. Although The UOS Times introduced only seven study lounges, there are still more lounges throughout the campus. With this article, we hope students know they have more places to study in besides the Main Library.